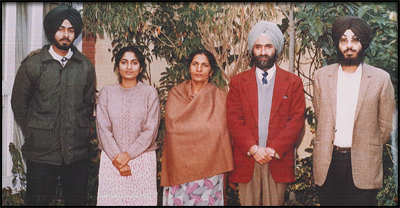 Dr. Jagraj Singh was born in village Mari Megha, Tehsil Kasur, District Lahore, (now Tehsil Patti, District Tam Taran) in the Sikh heartland called "Majha" (Central Punjab), the land of early Sikh veterans. He had his preliminary education in District Board Millde School at Mari Megha. He passed his matriculation examination from Majha Khalsa High Scool Khalra and F.Sc medical from Khalsa College Amritsar, where Dr. Taaran Singh was his professor of Divinity. He was trained as an allopath at Arya Medical School Ludhiana. Thereafter, he had a short stint with government service in the Punjab, but soon he resigned his government job and started his private practice at the historic town of Sri Hargobindpur in Gurdaspur district. Before his migration to USA in 1998, he practiced there for about thirty-five years. During all these years of his life he witnessed the partition of the Sikh homeland during 1947, the Punjab Suba agitation by the Sikhs and the reorganization of the Punjab, the emergency of Indo-China war, emergency imposed by Mrs. Indira Gandhi, two Indo-Pak wars, Operation Blue Star, Operation Black Thunder and the aftermath. He had the good luck of coming into personal contact with almost all important Sikh political and religious leaders of the afore-said period. His grandmother Sardarni Aas Kaur (died 1960) used to tell him the sotries of the Sikh rule, Anglo-Sikh wars and the aftermath, which she had heard from her grand mother-in-law, wife of Kumedan Bagga Singh, who was part and parcel of that regime. Kumedan suffered an attack of the stroke at the surrender ceremony held at Kasur after the defeat of the Sikhs in the first Anglo-Sikh war at Sabhraon. He died the next day at their village Mari Megha. His father, Sardar Bhagwan Singh (died 1982), was a highly religious person and had great knowledge of oral Sikh history and religion, and he taught him both.